Here is some help starting with WordPress platform. WordPress is Open Source content management system (CMS) and comes with support for thousands of templates and extensions. It gained popularity through features, a plugin architecture, and a template system. WordPress is 100% free and you can download a self-hosted installation from WordPress.org. You can try it by installing it locally on your PC for testing and learning with tools like XAMPP, but if you would like it to make accessible on the world wide web you will need a hosting service. So let’s start. You are essentially renting a small portion of a server located at hosting provider to ensure your website is accessible through internet 24/7. You will also need to register a domain name at your hosting provider, the address where Internet users can access your website. A domain name is used for finding and identifying computers on the Internet. With information from your hosting provider login to the administration panel. Most hosting providers use cpanel or some very similar administration interface. 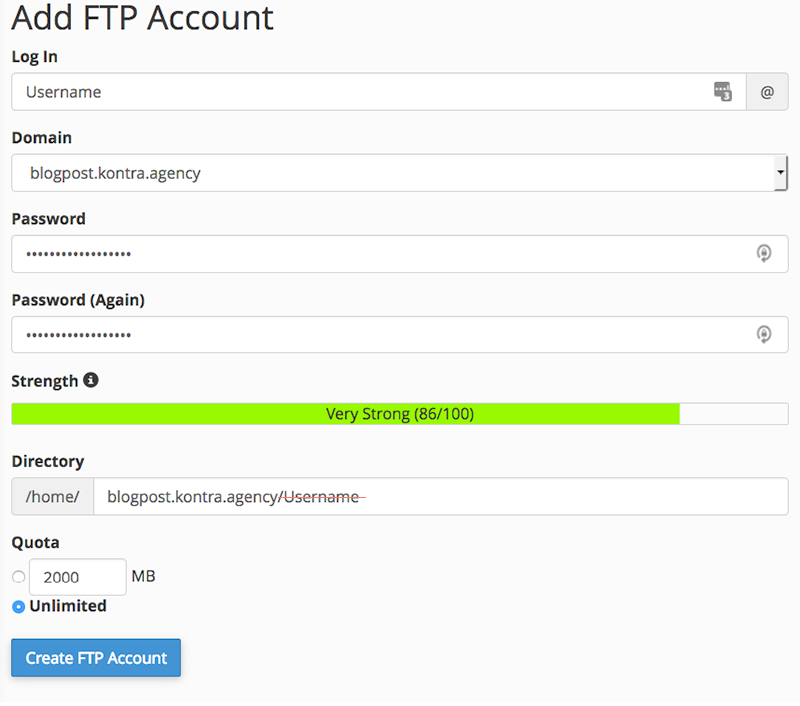 First, create an FTP account. In section Files click on FTP Accounts. You will need to enter Login username, choose a domain and generate a password. It’s a good practice to let cPanel generate your password to make it strongest. Also, remember to remove “/YourUserName” from directory input box. After making an account download configuration file for desired FTP client. Then, you need to make MySQL database and assign a user to it. 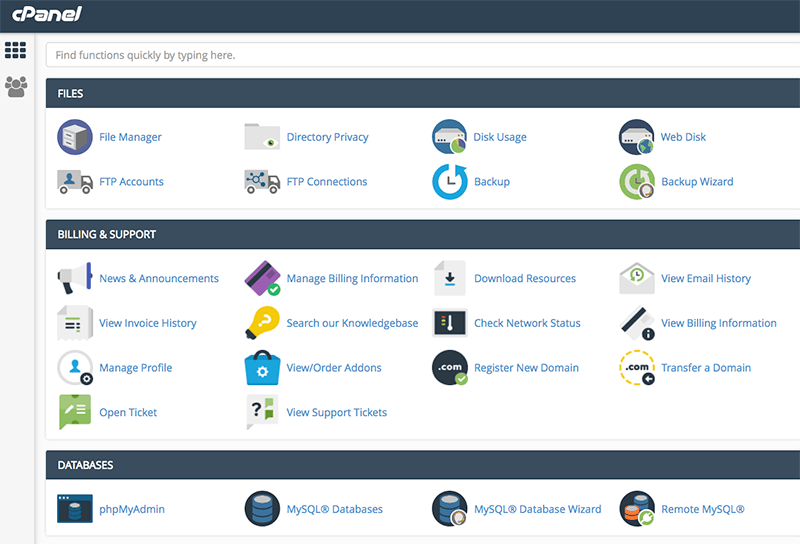 In cPanel click on MySQL databases and on the next page enter database name and click Create database. Under section MySQL users make a new user and add a user to a database with all privileges. Make sure to write down all these information. Now open FileZilla and import configuration file downloaded from cPanel FTP, enter a password and click connect. 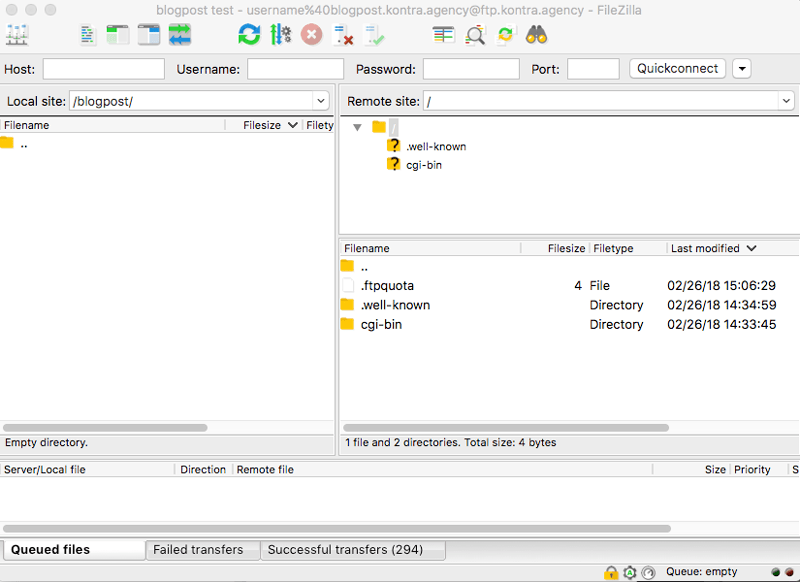 FileZilla is a file transfer protocol client between the server and your PC, like file explorer but for a remote server. The left screen is your files on your PC and the right screen is files on the server and you can just drag and drop files between them. There will be some files when you enter, just leave them, these are server files. So just visit wordpress.org and download the latest version of WordPress. Extract WordPress zip and transfer all files to the server. When you are done transferring files just visit your URL and installation should begin. 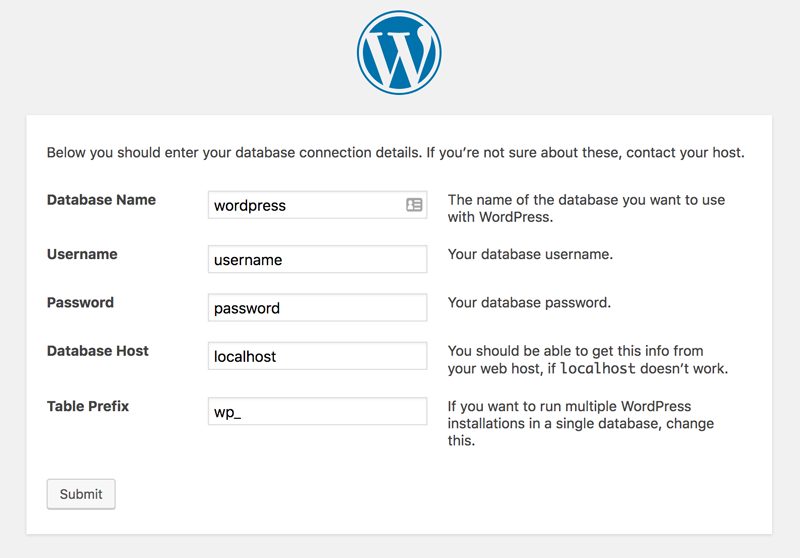 The first step is to choose language and connect WordPress to a MySQL database we created before. So fill in the Database name, username and password from the user assigned to the database. 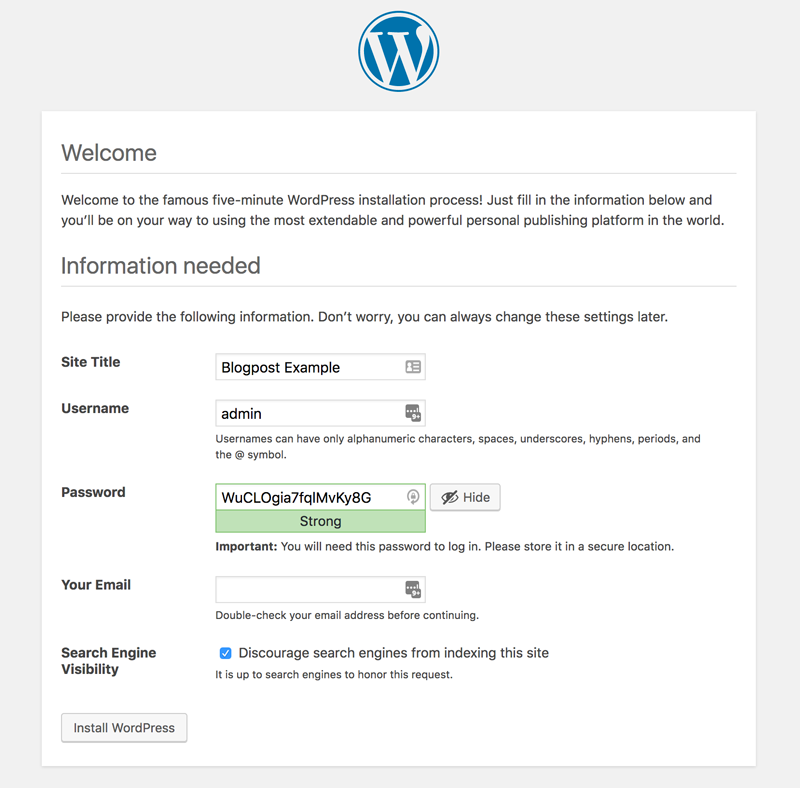 After clicking submit WordPress will test the connection, and if entered data is valid we can run an installer. Next screen will help us set up some basic setting for our website. We need to choose site title and make administration account which will be used to login to your administration panel. And that’s it, next step is to log in to admin panel to finish the installation. Here you can change a look of your page by changing a theme, make a new page or a blog post like this one. Don’t know how? Wait for my next blog post to learn more about customizing WordPress.